In a way, I have been waiting (not so patiently) for this book. Not that I had ever heard of this book prior to reading it, I hadn't. I didn't know that this book existed. But I had been waiting for a book to move me. And this one did. You get pulled into this nightmare from the first page. Being a parent, this one really freaked me out. I can't imagine my child having to go through that kind of experience. Listening to your family being brutally murdered? Absolutely terrifying. I have a VERY vivid imagination and I often picture in my mind, the events of a book - especially when the book is well written. This happened with What Doesn't Kill Her. 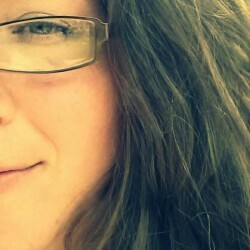 I could hear Jordan's mother calling to her, I could hear each footstep coming down the hallway ... I was terrified for Jordan! I really liked watching Jordan transform from an emotionless mute to a very determined and angry victim. But I didn't see her as a victim. She is the definition of a survivor. Jordan was such a strong woman, just biding her time, waiting. I really don't think that she could have been written any better ... I love strong female characters! 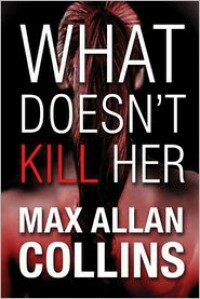 Max Allan Collins is an amazing author. I had not read anything from him before this and that is going to change. Man, he's just awesome. The plot was absolutely perfect, the characters were so developed that I could relate to them as people and the book wasn't full of extra "fluff" (those unnecessary paragraphs full of info or descriptions that really aren't needed and usually just tick me off because they are a waste of my very precious reading time). What Doesn't Kill Her is one of those books that you pick up and don't want to put down ... unless you have the flu while reading ... which I did ... and then you would rather die than get out of bed or crack your eyes open to read a page ... but if you don't have the flu you should totally pick this book up ... it would be great to read while sitting by the pool or by a fire with a cup of hot chocolate (I'm hoping hot chocolate / fireplace time is coming soon even though it feels like 900 degrees outside right now).